It's so simple that is calming. an't knock that. This is a very appropriate post - in light of hte fact that I went to bed last night already salivating over the cup of coffee I would drink this morning! Coffee drinking is a special routine, particularly among writers. Got our special mug? Check. Got our steaming cup of joe? Check. Got our writing cap on? Check. All systems go! Sometimes the simplist mugs are the best! I never knew Swedes were the biggest coffee drinkers. I bet they have great coffee! I might have to add it to my list of places I want to visit :) Yeah, I'm that big of a coffee drinker, haha. Fascinating about Swedes drinking so much cofee - who would have guessed? I like your simple mug - clean lines and fit for purpose! My favorite cup? A perfectly glossy, green mug that fits my hands perfectly! Perfect! I DO have the coffee getting cool too quickly problem. Hmmm... Need to find a six ounce mug. I love how much you love your mug. THANKS SO MUCH FOR PARTICIPATING AND SHARING THIS WITH EVERYONE! 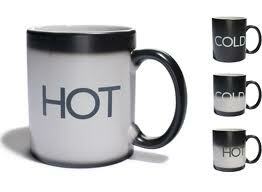 Mugs are great in all shapes and sizes. I love having bunches around- plain or fancy and vintage mugs are awesome! I really like that mug. You can see how much you have left too which would come in real handy for me because then I wouldn't assume there is no tea and up-end it on myself. Plus I think the simplicity is pretty neat. This is awesome. Really enjoyed these. I'm a follower now. I love learning new things and I had no idea how much Swedes love their coffee. I know what you mean about just the right size mug. I HATE cold coffee. Thanks everyone for your lovely comments. Glad to hear your corroboration that simple is nice too.